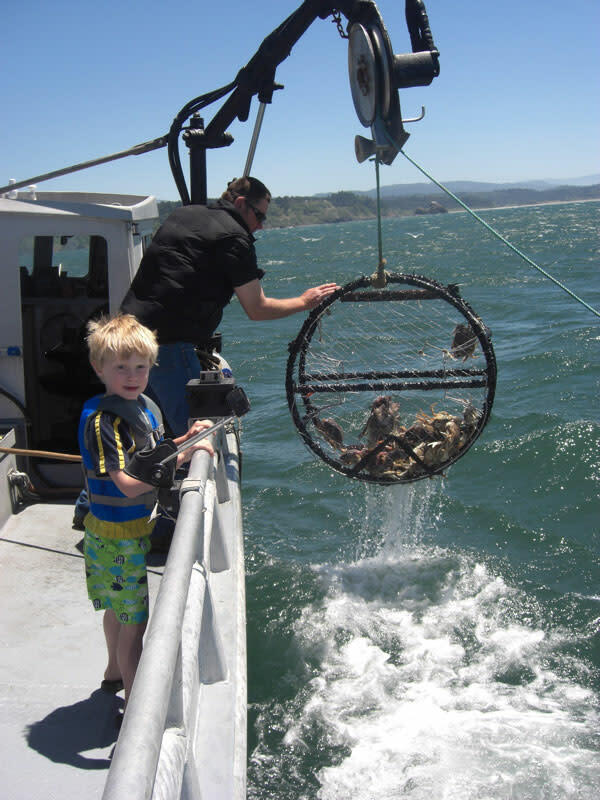 Oceans, Rivers, Lagoons and Humboldt Bay - If you like to fish, we've got the spot. Pacific Outfitters Adventures Enjoy fishing or crabbing from a kayak in a beautiful setting with epic rock gardens and towering sea stacks which are home to some of the largest black snapper, cabezone, lingcod, Pacific halibut and dungeness crab on the West Coast. You may also catch red snapper, China rockfish and greenlings. We will supply everything you need, including the fishing and crabbing gear, lures and bait. 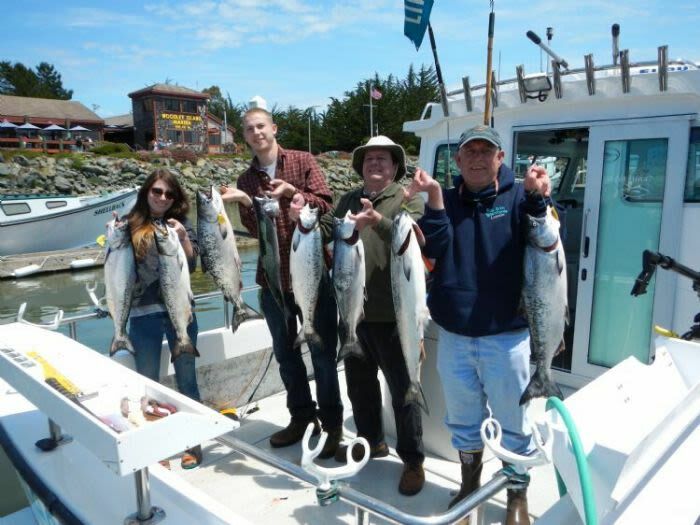 Trinidad Bay Charters - Jumpin Jack Trinidad Harbor 707-839-4743 Half-day fishing trips, twice daily, with light-tackle rock cod or salmon fishing, and crabbing (gear included). 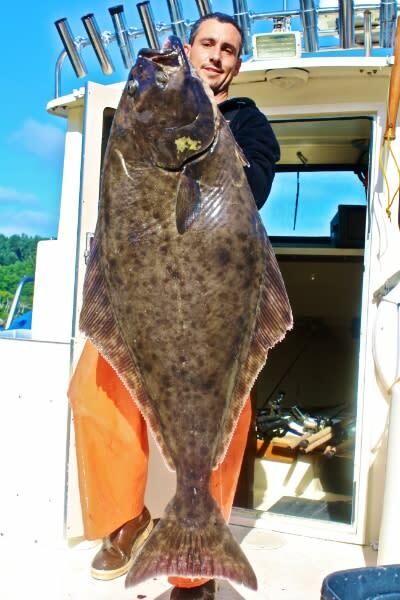 Northwind Charters - Sport Fishing Trinidad, CA 707-601-0034 or 707-616-5803. Salmon, tuna, rockfish, halibut salt and fresh water sport fishing experts. Patrick's Point Charters - Toni Rae II Trinidad 707-445-4106. The Toni Rae II offers salmon, rock cod, crabbin & specialized charter sport fishing trips. Reel Steel - Woodley Island / Eureka Humboldt Bay Custom fishing charters for groups of four of less. We provide all tackle and bait. With over 30 years experience fishing local waters. 707-499-4925. Ocean Grove Lodge in Trinidad offers small group fishing adventures & accommodations. Sylvan Harbor RV Park & Cabins in Trinidad offers boat parking and fish cleaning stations & accommodations. Klamath River Lodge in Orleans is a fishing resort on the Klamath River. Dean Creek Resort in Redway offers accommodations near fishing on the Eel River. The Mattole is a remote, free flowing river with no dams and a wild population of steelhead. It is located in the Southwest corner of Humboldt county, about 65 miles south of Eureka and 260 miles north of San Francisco. There are approximately 26 miles of fishable water from the mouth to the town of Honeydew. The fish of this river are wild with no hatchery fish being introduced. Catch and Release is asked for these fish. The primary fish of interest for the Eel include steelhead, chinook, coho, and sea-run cutthroat trout. Chinook start coming into the river in August. They tend to hold in the waters below Ferndale Bridge until rains allow them upstream. The run is from August through December, with the peak in late October. The Eel flows through some of the most beautiful redwood groves in the state, including Humboldt Redwood State Park. Van Duzen River A tributary, entering the Eel at Alton, and like the Eel it’s noted for good runs of salmon and steelhead. The Van Duzen is regularly stocked by the Pacific Lumber Company hatchery located upstream on Yeager Creek. Runs Coincide with the Eel. Mad River The species of the Mad include steelhead, king and silver salmon, and resident trout. The Mad has become known for its excellent winter steelhead, due in large part to the operation of the Mad River Fish Hatchery, which is located one mile southeast of Blue Lake on the south side of the river. The Trinity River is world-famous for its fine steelhead and salmon fishing, as well as for trophy brown trout. Chinook salmon are the most sought-after gamefish in the Trinity River system. 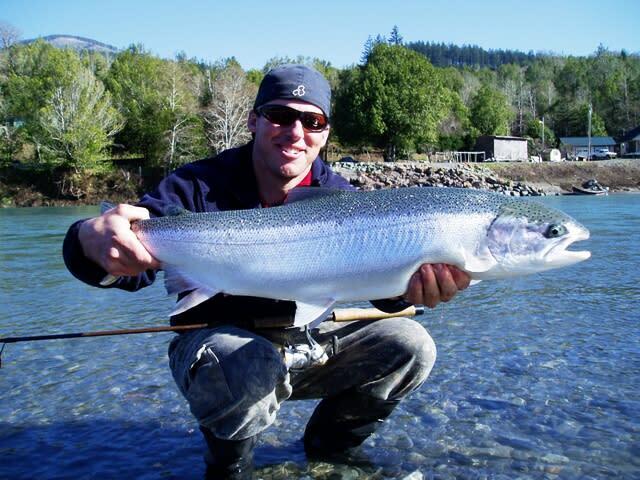 Spring-run salmon begin to enter the river in May and provide trophy fishing through November throughout the river. Although brown trout are not native to the Trinity River, they were heavily stocked until the late 1970s. Today, a wild population continues to the upper river, providing fly and bait fishing for mostly 10- to 14-inch fish, although an occasional trophy to 10 pounds is sometimes landed. The Klamath River is the largest of the North Coast rivers of California stretching over 200 miles from its mouth to the Oregon border. Its mouth is located 60 miles north of Eureka and 20 miles south of Crescent City off Hwy 101. The fish of the Klamath are king and silver salmon, steelhead, and resident trout. The kings start running in July with the best action near the mouth coming in August and running through September. Summer/Fall steelhead start running from late summer through October. The winter run starts in November and goes through February. LAGOONS Located between Trinidad & Orick along Hwy 101 is a magical collection of landlocked waters, right on the coast but protected from the Pacific Ocean. The Humboldt Lagoons are a unique ecosystem providing unlimited outdoor recreation! Big Lagoon and Stone Lagoon are brackish because their ocean barriers are breached by storms nearly every winter and are a favorite fishing spot for cutthroat trout. Freshwater Lagoon does not get breached and is open all year featuring rainbow trout and black bass.